This month, I was assigned the blog baking + creating with avril + as I starting looking through her wonderful creations, I knew I’d have no trouble finding a recipe to make. When I came across her post for york peppermint patty brownies, I knew I had found a winner. I’m a huge fan of the chocolate/mint combo (as you may know from this recent post), so I decided to give them a try. But wait! As I was about to start baking, I remembered something. I had seen a very similar recipe in martha stewart’s cupcakes. The difference? Martha’s brownie batter was baked in a muffin tin to make individual brownie ‘cupcakes’ rather than in a single pan + cut into squares. With this in mind, I adapted the recipe from Avril’s blog, making brownie ‘cupcakes’ rather than the traditional squares. So, how’d they turn out? First, let me say that baking brownies in a muffin tin is genius. The individual brownies are a perfect single serving, + frankly, adorable. They turned out positively scrumptious – moist + seriously chocolatey, with a perfect hint of mint. I worried that the mint overpower them, but it didn’t – the rich brownie perfectly balances it + even people who don’t normally like chocolate/mint desserts (ahem, my husband) said that these were amazing. Hooray! Thank you to avril for introducing me to a fabulous new dessert, + to the secret recipe club for connecting me, yet again, with fantastic bloggers + amazing recipes! melt chocolate + butter together in a double boiler. stir occasionally just until melted, around 4 to 5 minutes. remove the mixture from heat. whisk in the sugar + salt until the mixture is smooth. whisk in the eggs + vanilla until combined. gently whisk in the flour + cocoa just until smooth, taking care not to overmix. spoon 1 heaping tablespoon of batter into each lined cup of the muffin tin. place 1 peppermint patty on top of the batter in each liner, pressing down gently to push the peppermint patty into the batter. spoon another tablespoon of batter into each liner, making sure to completely cover each patty. bake at 350°F for 30 minutes, or until a cake tester inserted halfway into the cupcakes (above the peppermint patty) comes out mostly clean. let them cool completely, then serve with or without paper liners still attached. Those look so cool! And YUM! These are wonderful! I love them! Mint is the best and right in a brownie!! yes! Oh boy, do these look yummy–chocolate and mint are a favorite pairing of mine! And you are so right–the Secret Recipe Club is a wonderful opportunity to meet fellow foodies who are as recipe-crazed as I am. I love mint treats, hubby can’t stand them. I guess that just leaves more for me. Chocolate and mint – best combo ever! I awarded you the Versital Blogger Award. Head over to my blog to claim it. Have a great day! this sounds so good. 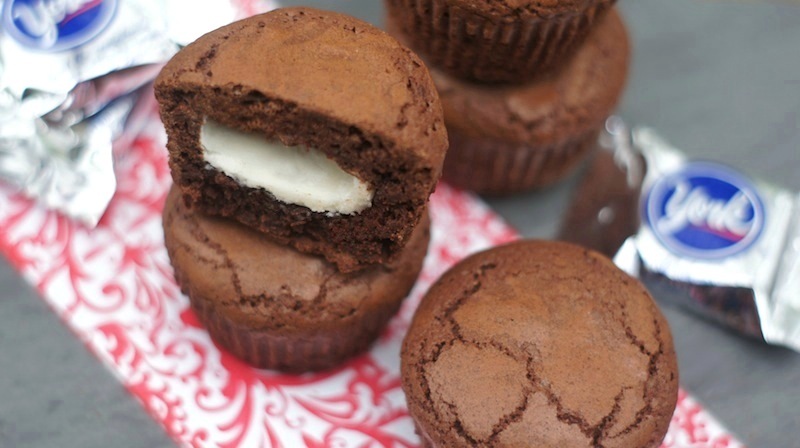 I love how you adapted the recipe and were creative making them into brownie cupcake! This sounds so good! I love that it’s filled with a minty center because I LOVE chocolate and mint together great recipe, Amy!! ha! chocolate-tastic desserts have that effect on me, too. =) so glad to meet you through the SRC, kristy lynn! oh my goodness, you had me at peppermint-patty-filled! It’s one of my favorite candies (next to Reeses!) I will definitely be trying these!!! Wow…those look awesome! mint and chocolate together is my all-time fav! These sound terrific, Amy! Your pictures are just stunning. oh my goodness. these would be dangerous for me. i LOVE peppermint patties! oh gosh i need to try this recipe asap! I love peppermint/chocolate mix! Those muffins look so delicious ! Drooling ! Chocolate and mint is my favorite combination. 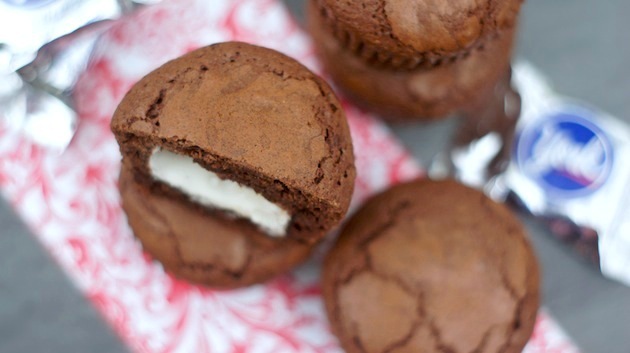 These look so adorable and heavenly! I saw the recipe in Martha Stewart Cupcakes. I love that you’ve adapted it to a cupcake version. Love chocolate and mint – a great combination. I love that cute little apron you’re wearing in the picture on your homepage! Nice adaptation to the recipe. We just launched the all new seasonapotluck.com and I’d love if you would check it out! 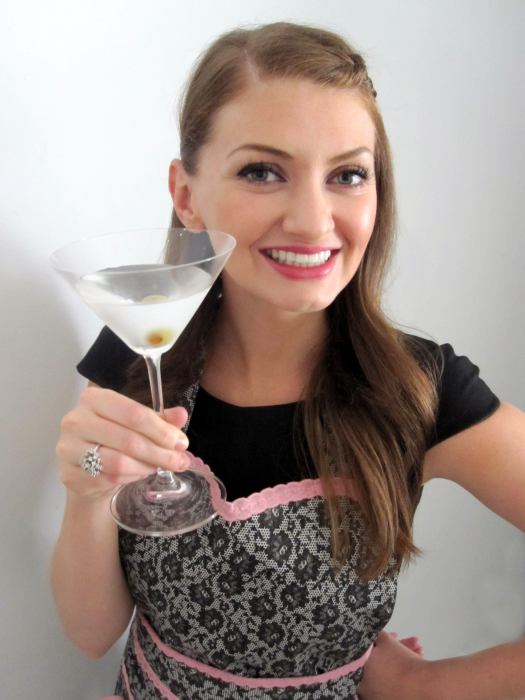 April is peas month, so if you have any great peas recipes, join the fun and link up! We’d love to have you.